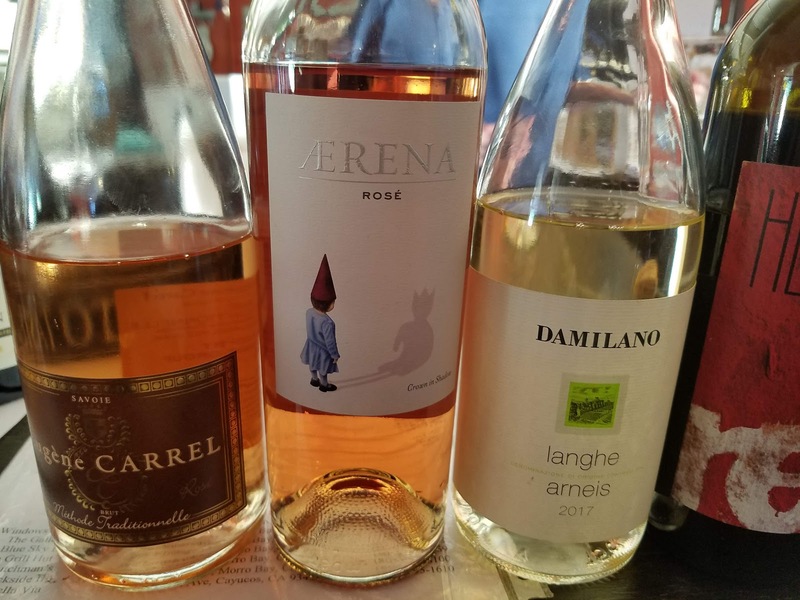 Wine #1 – NV Domaine Eugène Carrel & Fils Brut Rosé, Jongieux, Savoie, France. 100% Gamay. Sparkling wine from the French Alps. Methode Traditionelle. Very light red/pink color leads you down the path of the style: crisp, light, mouth-watering acidity. It's zesty! Citrus zest, minerality, red cherry and raspberry. Eugene Carrel & Fils is located in the village of Jongieux, about 40 miles southwest of Geneva, in between the Rhone River and Lake Bourget, France’s largest lake. Established in the 14th century, Eugene manages the estate with his son Olivier and his son-in-law Sebastien. The vineyards are situated at 1,476 feet and planted on steep, southwest facing slopes to calcareous clay soils. Despite their proximity to the Swiss Alps, the climate is surprisingly warm; Jongieux enjoys 2-3 more hours of sun than any other area in the Savoie. Consequently, the fruit reaches phenolic ripeness, resulting in wines that are balanced and fresh. The majority of Carrel’s wines are vinified in stainless steel tanks. Wine #2 – 2017 Aerena San Francisco Bay AVA Rosé, Contra Costa County, California. Winemaker Aaron Pott draws upon grapes from 135-year-old vines in Contra Costa County's Del Barba Vineyard for this zesty Carignane and Mourvèdre mix. The wine offers up a good bit of raspberry fruit with a dash of sweet grapefruit and a slightly spicy Rhônish bent. It is medium-full in body and slightly rounded in feel with integral acidity keeping it lively and ensuring that it will team effortlessly with food. Del Barba Vineyard is organically managed and the vines are own-rooted. The wine is made from roughly equal parts old-vine Mourvèdre and Carignan. It’s bright, crisp and refreshing with crushed raspberry, orange zest, pink grapefruit and sandy minerals. Wine #3 – 2017 Damilano Arneis, Langhe, Piemonte, Italy. Pale straw yellow in color, this wine offers delicate fruity aromas. On the palate, it is dry and fresh, with elegant flavors and moderate acidity. Suitable for appetizers, fish courses and white meats. Arneis is a white wine grape variety from Italy's much-respected Piedmont wine region. Arneis has been rescued from the verge of extinction and is now enjoying something of a revival. By the 1960s, just a few hectares of Arneis vines remained, and only a handful of producers were making the wine. There are now more than 1500 acres (605ha) of Arneis vines in Piedmont, and small quantities are also grown in California, Australia and New Zealand. My students LOVED this wine! Wine #4 – 2015 Heinrich RED Burgenland, Austria. 80% Zweigelt, 15% Blaufrankisch, 5% St. Laurent. Gernot and Heike Heinrich founded their winery in 1990 with just one hectare and have steadily grown to 90 hectares today. Heinrich converted to biodynamics in 2006 and is a member of Respekt, a certifying body for biodynamic viticulture in Austria. All of Heinrich’s wines are fermented spontaneously and are often left with the skins for several weeks. The wines remain on their lees for an extended period and are vinified mainly in neutral oak casks. Gernot says, "we give the wines plenty of time to mature, the time that hardly anyone has today,” and adds, “it is above all else time that shapes our wines.” RED is a blend of Austria’s signature red grape varieties: the soft and fruity Zweigelt; structured and spicy Blaufränkisch; and the aromatic St. Laurent. It is aged for 12 months in used 500-liter oak casks. Zweigelt serves as the wine’s base, providing soft and juicy red-berried fruit, while notes of tobacco and spice come from Blaufränkisch. A small percentage of St. Laurent lends floral aromas and refreshing acidity. Pair this wine with the richness and flavor of roasted game birds or earthy chanterelle mushrooms. My students were divided in their opinions about this wine. Half of them loved it; the other half, not so much. Wine #5 – 2017 Saint Cosme, Cotes-du-Rhone, France. 100% Syrah. Château de Saint Cosme is the leading estate of Gigondas and produces the benchmark wines of the appellation. The property has been in the hands of the Barruol family since 1570. Louis Barruol took over from his father in 1992 making a dramatic shift to quality and converting to biodynamics in 2010. 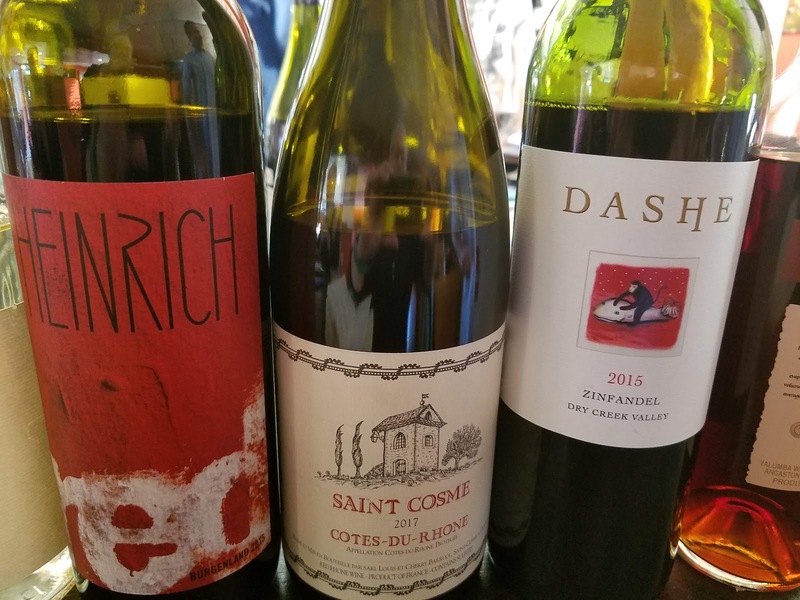 Saint Cosme Côtes-du-Rhône is produced from 100% Syrah and is from the rocky and cool vineyards of Vinsobres and the stony Villafranchian terraces of the Gard. Vinsobres brings freshness and complexity while the terraced vineyards of the Gard contribute color and power. The wine is partially destemmed, fermented with natural yeasts, and vinified in concrete vats. This Syrah grows in ideal terroirs of the southern Rhône and shows the varietal’s typical spicy notes of sandalwood, violets, and black pepper. Syrah, with its deep flavors and firm tannins, is a natural match for grilled or smoked meat and dishes featuring herbs, roasted mushrooms, and onions. I, personally, plan on drinking a lot of this wine. Wine #6 – 2015 Dashe Zinfandel, Dry Creek Valley, Sonoma, California. This wine is a classic example of a Dry Creek Valley Zinfandel. The coastal fog in the morning combined with afternoon heat makes for ideal ripening conditions, resulting in a wine with great balance and intense fruit flavors. The wine is made from fruit grown on five small family-owned vineyards in the center and north of the Dry Creek Valley. The wine shows a bright acidity from the cool ripening conditions, which blends perfectly with the forward fruit from the vineyards and results in a particularly complex, lovely, and balanced wine. 2015 was a vintage marked by extremely small yields, so there was almost half the normal quantity of grapes per vine in this year. The result was a particularly intense wine. The wine was fermented using only the natural yeast population on the grapes, and aged for 10 months in older French oak barrels. 4% Petite Sirah was added for structure and aging potential. Black raspberry, black cherry, hints of plum, chocolate, and licorice, with an underlying floral component of violets. I have often said that, if I'm going to have Zin with food, I want it to be from Dry Creek. This wine completely validates my preference. Wine #7 – Yalumba Antique Tawny Museum Reserve Dessert Wine, Yalumba, South Australia. Yalumba began making wines at the Angaston winery more than 167 years ago, and the production of fortified wines has long been part of that history. This wine is blended from antique barrels, and laid down for many years. Made over five decades ago, the original wines were blended from old-vine varieties such as Shiraz, Grenache, Mourvèdre and Muscadelle. Since 1985, the use of Portuguese fortified varieties Touriga, Tinta Cao and Tinta Molle has added complexity to the blend, bringing finesse and elegance to this wine. The grapes are crushed and fermented on skins for several days to extract the fruit flavors and to build palate texture. After draining and pressing off skins, the fermentation is stopped by fortification with brandy spirit. The vintage wines are then put aside into small oak barrels to mature over time, developing the classic tawny characters of chocolate, caramel and wood aged nuttiness. After many years of maturation, a selection of older and younger wines are judiciously blended to produce wines of complexity, balance of fruit and aged characteristics. 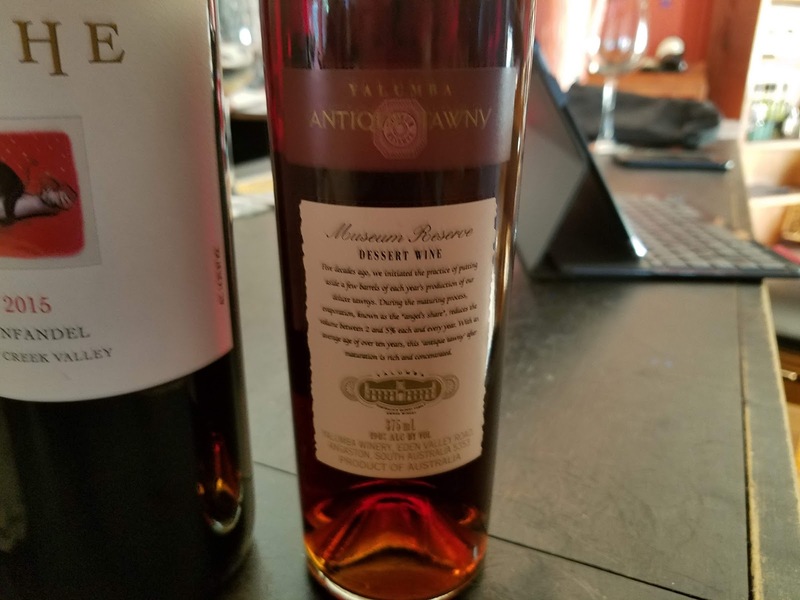 Amber tawny in color with an olive green hue, exhibiting aromas of rich toffee and caramels, sweet figs, chocolate, caramel and licorice spices with elegant brandy spirit and hints of nutty wood aged complexity. The palate is richly flavored, featuring caramel crème brûlée and lingering flavors of dried fruits and nuts. The texture is sweet and smooth roundness from the wood maturation, and brandy spirit filling out the middle palate, providing the firm, drying finish. Pair with Stilton or hard Cheddar, ginger flavored pudding, pumpkin pie, apple pie, berry pie. Hope your holidays are filled with love, laughter, and great food and wine! Cheers!